This cellar hole, once located on the shores of the Hudson River, provided a number of challenges and a few early large cents. In early spring, the lush green of former flower beds is a dead giveaway to such sites. There is something about being in the woods on an early spring morning just after dawn. There's still just enough briskness in the air to warrant thoughts of the last winter, and yet raise the hopes of the coming warmth of another summer. There are distant bird calls from high in the canopy and the sounds of last fall's leaves crunching under your boots, and the very ground beneath your feet seems to churn and vibrate with growth which will soon explode from the forest floor in its yearly burst of colorful splendor. There's a hush in the air, complemented by a thin fog which enshrouds the surrounding trees, and it's time like that, cloaked in the solitude of the woods and far from the maddening pace of the 20th century, when I'm glad to be a relic hunter. 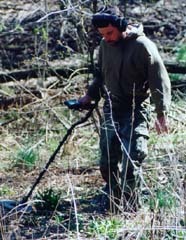 Thankfully, I have a lot of mornings like that... no faxes, no e-mail, no cell phones- just a guy hiking in the woods, a metal detector in hand, a backpack secured, and the hope that history will soon reveal itself in the bottom of a freshly dug hole. Earlier that morning, in the predawn darkness, I began running down a mental checklist of equipment I would need for the day's search. We would be doing a lot of hiking during the course of the day, and only the essentials and a few backup components would be stowed in the backpack. Pinpointing another target, relic hunter Gene Salvino works the gentle slopes around the first site. Having assembled all of my equipment on the back porch, I sat with a second cup of coffee, watched as the night grayed with the coming dawn, and thought about the sites we would be searching, moss- and lichen-covered stone foundations of former dwellings which dotted the wooded landscape along the Hudson River. My thoughts ranged from strategies for the hunt to possible recoveries, but I knew it was time to stop thinking and start doing when I heard Gene's F-250 pull into the driveway. Within a half hour, we had added Gene's friend Mark to the company, and, along with four dogs, we hiked to the first cellar hole where Mark had recovered an early crotal bell the week before. Sitting on a high bank, the foundation was typical of those which once lined the shores of the river. However, the banks of the river today are not where they were 200 years ago, and reading the lay of the land is important when searching such a site. During this century, the river had been dredged, and the sand removed from the channel was added to the shoreline. As a result, many dwellings which once fronted the river are now over 250 yards from the water. Seeing and knowing where the old river band was, saves the relic hunter from wasting a good deal of search time and effort on dredged ground devoid of relics associated with the site. We concentrated our efforts on the slopes surrounding the foundation and searched between the former house site and the remains of an old outbuilding and stone-lined well. My first solid signal was also typical of such sites... brass harmonica pieces. I have a theory that everyone who lived in the 19th century was issued at least three of these musical instruments, and that to prove your citizenship all you had to do was slap the old Hohner down on the table in front of you. It is a rare cellar hole search which doesn't produce at least several of these all too common finds! A pocket watch and several coins and tokens surfaced during our initial search, but knowing we had other sites to hunt, we didn't linger once recoveries became increasingly scarce. Besides all the background chatter of your detector discriminating out the assorted nails and small iron debris which so often litters such sites, the next most common "garbage" signal is that produced by shotgun shells. At that first site, alone, each of us dug at least half a dozen; but if you don't dig them, you will probably miss quite a number of small buttons and any pewter targets. In especially trashy areas, it's often a good idea to switch to a smaller coil in order to isolate desirable targets from the debris. Detecting in an area of rocky soil near what may have once been an entrance to the former dwelling, I was able to recover the first large cent, dated 1820. This was followed only minutes later by another, dated 1812... and then an Albany, New York Civil War "store card" (merchant's token) for Union Flour. Suddenly, just as quickly as the finds were made, they stopped. 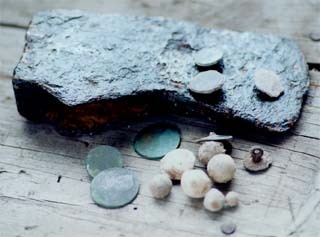 Despite all of our efforts, we found only a few more buttons, dating from the first half of the 1800s. So, after searching on the other side of a small creek and carefully working the sloping ground of the former riverbank, we decided to head for the second and older site. 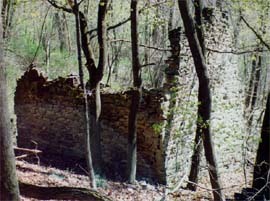 Following a hike of better than a mile, we came upon the ruins. 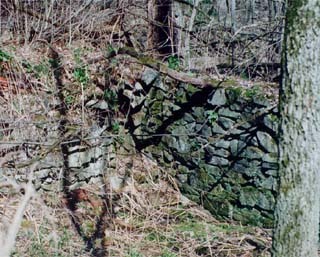 The condition of this site was far better than the first, and amazingly, two of the stone walls were still standing. As with the first site, the area directly in front of the dwelling was dredged material, and we confined our search to the areas of sloping land north, south, and west of the site. The following day, club member Roger Maben joined us at the edge of the river to share a cellar-hole find he had made the previous day. Gene was the first to score a target of importance. Searching in an area well above the level of the ruins, he pulled a King George copper from the soft soil. As on many of these we find, there was nothing remaining of the date, the coin having been in circulation for such an extended period of time, but the image of King George II was clear. Judging from the amount of wear, we figured that it was probably lost around the time of the American Revolution... a date which coincided with the age of the site, according to local historians. During the next three hours we were able to recover a number of one-piece buttons of brass and pewter, another well-worn copper coin of indeterminate age, and an early axe head. One of the things which surprised us was a small section of the ground which produced a number of musketballs of varying calibers, ranging from those used in a musket or smooth-bore fowling piece, to the size commonly used in squirrel guns. You could almost picture some long-ago resident sitting on the porch and taking shots at forest animals which came down to the edge of the river for a drink. It was the way they put dinner on the table in those early days... black powder and a keen eye! Roger's remarkable recovery... an 1839 Capped Bust half dollar in beautiful condition! Those abandoned early dwelling sites, which dot the landscape in many areas, offer the relic hunter an interesting challenge. Often you have to employ every trick and strategy at your disposal... triangulating outbuildings and wells, working slopes, and searching for the remains of old orchards and fruit trees. We also look for dump sites and former flower gardens, while at the same time attempting to "thread the needle" through the amassed debris of centuries. But for all the difficulties such sites present, I've seen some incredible finds made- everything from the buttons of Grandpa's old uniform that he so proudly wore during the War of 1812, to the buttons of returning troops from the blood-soaked battlefields of the Civil War. I've dug Colonial shoe buckles and seen belt and hat plates pulled from such seemingly inappropriate grounds. Some of these sites produce little, other than a certain amount of search experience and blisters, while others prove to be a time capsule of our nation's past. You can never tell what you are going to find, and the unusual is usually typical. Like a stone sentinel on the wooded landscape, the ruins of this late 1700s house once graced the shoreline, but are now nearly 250 yards from the water's edge. Given that last statement, I don't know why it should have surprised me so much when Roger Maben came down to the shores of the river on the day following our hunt, bearing a large smile and his most recent cellar hole find. "Remember telling me to work any of the slopes around the site that would lead to a water source?" asked Roger. "Well, I did. Check it out!" 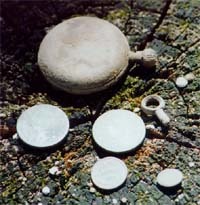 The second and earlier site provided us with some interesting relics, including King George coppers, one-piece buttons of pewter and brass, musketballs of various calibers, and an early axe head. 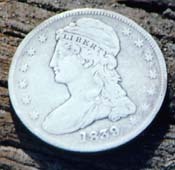 He passed me a large silver coin... an 1839 Capped Bust half dollar in beautiful condition. "Y'know, Ed," he said, "you can never tell what you're going to find at those sites!"